Mario is an amusing video game character created by Nintendo that has been around since 1981. He can be seen in over 200 video games today and has served as harmless entertainment for people of all ages. However, People for the Ethical Treatment of Animals (PETA) has begun to see it differently. PETA is more than disgruntled with the recently released game, Super Mario 3D Land for the Nintendo 3DS, where the popular character can be seen wearing a tanooki suit. Tanooki are Japanese raccoon dogs that are commonly hunted for their fur. Mario wears the skin of a tanooki in order to fly throughout the game. 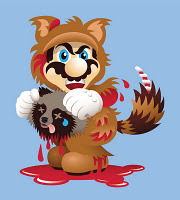 On their website PETA explains, “When on a mission to rescue the princess, Mario has been known to use whatever means necessary to defeat his enemy – even wearing the skin of a raccoon dog to give him special powers. “Tanooki may be just a suit in the game, but in real life tanuki are raccoon dogs who are skinned alive for their fur. By wearing a Tanooki, Mario is sending the message that it is OK to wear fur,” says PETA. A graphic and alarming video can be seen on their site of multiple tanooki being beaten, tortured and killed. By posting this video, PETA hopes to enlighten people about how these animals are treated and that it is unnecessary to kill them. They want people to understand the severity of this issue and realize that it is not something that should be joked about in a video game or anywhere else. Also on the website, PETA has created a graphic version of the Mario game where the character can be seen wearing a disgusting, bloody suit with the head of a dead tanooki. The tanooki can be seen running after Mario, hairless, attempting to reclaim his fur. Anyone can go onto the website and play the fun, yet terribly disturbing, game. “When people learn that millions of innocent animals are beaten, boiled, hanged, and electrocuted for their fur every year; that each fur coat, each piece of fur lining or fur trim, and each fur cat toy represents the intense suffering of dozens of animals; and that furriers intentionally mislabel the fur of cats and dogs as fur from other species or as faux fur—then every decent human being will want to go fur-free,” the organization writes on the controversy of wearing fur. While PETA sees this as a totally legitimate thing to make an issue out of, some people see it differently. Whether people view this as PETA taking it too far or not, the skinning of tanooki is not an issue that should be taken lightly. They just make up issues to complain about.